If you’re a Debian user, you are probably already familiar with some of the awesome icons for IceWeasel (rebranded Mozilla Firefox), IceDove (rebranded Mozilla Thunderbird) and IceApe (rebranded Mozilla SeaMonkey). 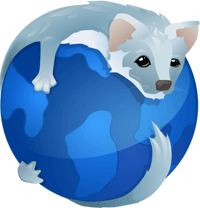 I was pretty ambivalent about the decision to rebrand Firefox until I saw some of proposed the IceWeasel icons which — in my humble opinion — were just too cute, and awesome, to pass up. I was extremely disappointed when I installed Iceowl and discovered that it does not ship with an awesome logo or icons showing a picture of an “IceOwl.” Instead, it seems to be represented by picture of a (boring) paper calendar which is very generic and not awesome at all. IceWeasel, IceDove, and IceApe each include extremely awesome logos/icons that have really cool looking white illustrations of “icy” weasels, doves, and apes. IceOwl needs a similarly awesome logo to use as its icon. While illustrators need to imagine what an “ice ape” or “ice weasel” might look like, there is no such need for imagination in the case of an ice owl! As far as I’m concerned, this bug should be release critical. Hopefully, someone will upload a patch quickly! Finally, after many months of all of us suffering in silence, Nick Morrott came along and fixed the bug with the creation of this new, incredibly awesome, icy owl logo!